Universidade de São Paulo. São Paulo, Brazil. As any normal 10-year-old, I chose Charmander as my starter in Pokémon Blue. I would demolish any and every Pokémon that came after me and my little (pseudo-)dragon, but Blue’s (or Green’s, depending on which game you were playing) Squirtle and its evolutions would always put a big dent on my flaming lizard’s health, even KO’ing him sometimes. Losing my beloved Charizard would leave me with an undertrained Pidgey and some other HM slaves, so Blastoise did leave a sour taste in my mouth growing up. As a kid, I had a hard time understanding how that big fat turtle/tortoise could hurt so much my giant fire-breathing monster, but now, as a bigger kid, I decided to take a more detailed look at Blastoise’s power. Where a, b and c are the lengths of the axes, which yields an internal volume of 1.305 m³. If the carapace were filled half with organs and muscles and half with water, there would be approximately 653 liters of liquid stored in it. The cannon’s diameter was assumed to be around 10 cm each. Figure 1. Blastoise, as seen on the anime. Image modified from a screenshot. To calculate how strong its water attack is, a Hydro Pump (which has 5 Power Points [PPs], meaning that the Blastoise can use Hydro Pump 5 times) was compared to a water cannon. Information about water cannons can be found in a study made by The Omega Research Foundation (2000), which is an independent UK-based research organization (Fig. 4). This paper states that low pressure water jets have a pressure of about 150 psi (1.03 MPa), and some modern ones can have as much as 360 psi (2.48 MPa). As Bainbridge (2014) says, Pokémons are supernatural creatures that possess spiritual and supernatural powers (even Blastoises, I guess), so it will be assumed that the water in the shell is stored at 360 psi, the higher value. In this equation, c is the velocity of the water that exits the cannon, p is the pressure at which the water is stored and is the density of water. The equation is used to transform the stored pressure cargo into velocity when there is no vertical movement in the flow. Figure 3. 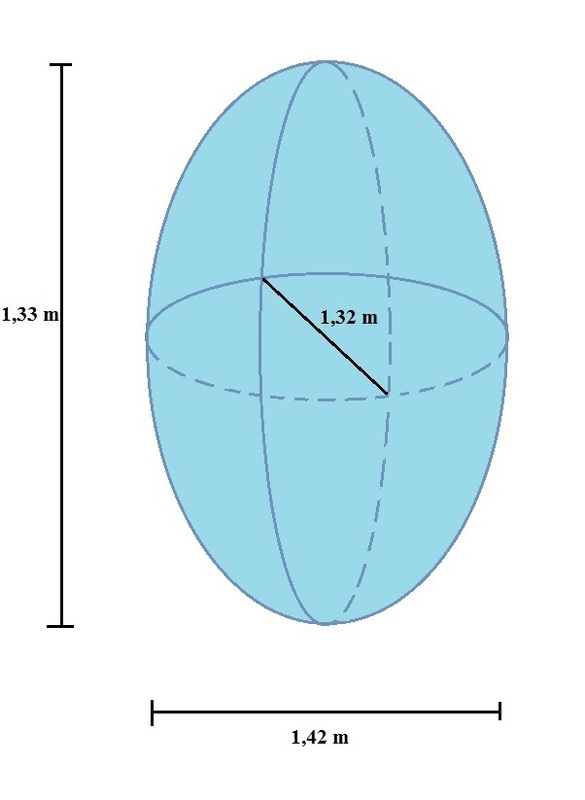 The “Blastoise ellipsoid”. Figure 4. Modern Israeli pulsed jet Water Cannon. Image reproduced from: The Omega Research Foundation (2009). The first equation is the force exerted by the flow, which is given by the multiplication of minus its mass flow (negative, as the water is flowing out of Blastoise) by the velocity of the water. The second equation is the kinetic energy of the moving water, given by its volume, density and speed squared. That translates to a 78 kN impact for 0.118 seconds, and about 324 kJ of energy. While it does not pack as much force as Ivan Drago’s punch (about 130 kN according to Rocky 4; his “punching power” was shown as 1850 psi; the punch’s area estimated at 0.01 m², the approximate area of a closed human fist), energy wise, one PP would have the same energy as an average car (1300 kg) going at 80 km/h. That would be tough for a Charizard to handle. So, after all, my Charizard really should avoid getting hit by one of those things. Some follow up questions do come to mind though, so let’s see what else we can come up with. IS MEGA BLASTOISE’S HYDRO PUMP STRONGER? 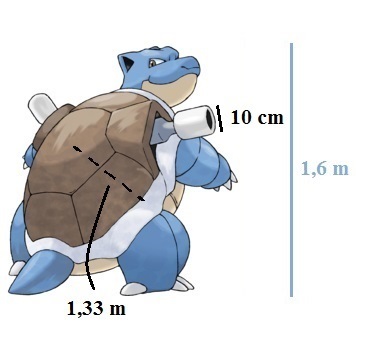 For this analysis, let’s assume that the pressure at which the water is stored in a Blastoise’s shell is directly proportional to its Special Attack. Blastoise’s base Sp. Attack is 85, whereas its Mega Evolution packs 135 (a regular Charizard has 109 base Sp. Attack, while its Y Mega Evolution has 159, so take that Blastoise!). The water pressure in Mega Blastoise’s carapace would be of 571.8 psi (3.94 MPa). 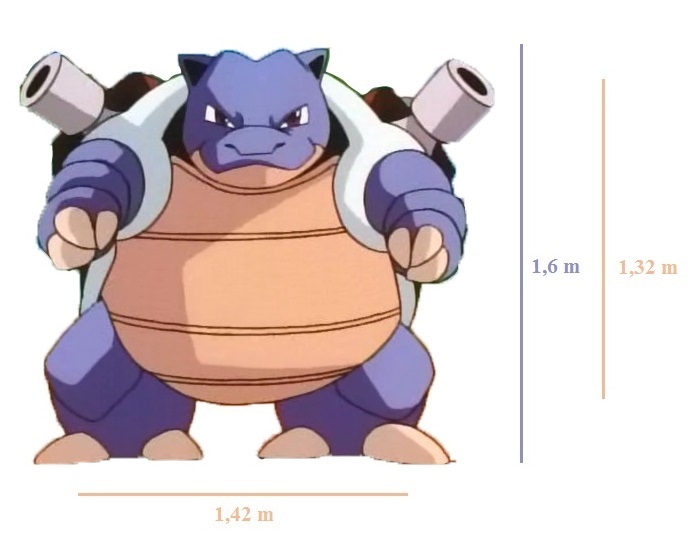 Another difference is in the cannon: while Blastoise has two 10 cm diameter cannons, Mega Blastoise has one that is significantly larger, assumed to be 20 cm in diameter, as seen in Figure 5. With these assumptions set, the force of a Hydro Pump’s PP would be of almost 250 kN, way stronger than Ivan Drago’s punch, and the energy it would contain would be of 515 kJ. Overall, Mega Blastoise really is stronger than its non-Mega counterpart, with its Hydro Pump carrying approximately 60% more energy and exerting a force 3 times stronger. The first equation calculates how high a body with mass goes when continuously firing downward a total mass of propellant at a given velocity c and at a mass flow while being accelerated by a gravity (9.8 m/s²). The auxiliary variables and n are the mass fraction, which is the quotient of the final mass of the body after the propellant is expelled divided by its initial mass, and the thrust induced acceleration. In this study, the body is a Blastoise and the propellant is water. The results are shown in Figure 6, a graph representing how high Blastoise goes according to how many PPs it uses. Figure 6. 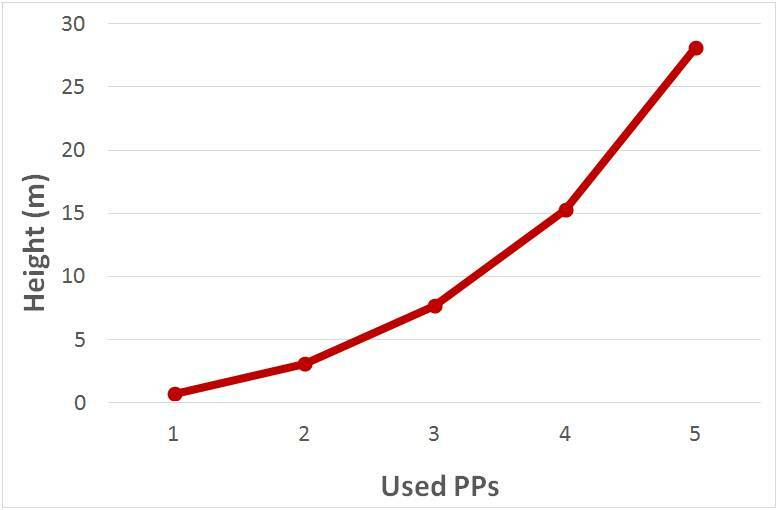 Graph of achieved height versus number of PPs used for Hydro Pump. Therefore, of course, the more Hydro Pumps used, the higher the Blastoise will go. When all five PPs are spent, Blastoise will fly as high as 28 m, which is about the height of a 10-story building. That will not get you from Pallet to Viridian, but it is pretty high for a turtle. HOW MUCH MUST A BLASTOISE EAT? It was hard to find information on the efficiency of turtles, so a human was taken as basis of comparison. An average human has a mechanical efficiency of about 25%. As turtles are ectothermic creatures, energy-wise they are more efficient than humans, as they do not spend energy to stay warm. Its efficiency is then a little higher and, as a semi-wild guess, it was assumed to be 40%. To most people’s astonishment, freshwater turtles are not herbivores. They do eat plants, but fish is a main dish on their diet. Blastoises, as freshwater turtles, would then eat what should be easier for them to find: Goldeens. Goldeens weigh about 15 kg and inhabit the same water ponds a Blastoise would. Nutritionally, freshwater fishes have about 150 kcal per 100 grams, so with 40% efficiency a Blastoise would have to eat a little more than half a kg of Goldeen to use all 5 PPs of Hydro Pump, which is a little underwhelming, as we were expecting some mass extinctions to take place. After our analysis of a Blastoise, it was concluded that they do pack a punch. With each Hydro Pump averaging 78 kN in force and 324 kJ in energy, the impact could damage any fire lizards that stands on its way. Aside from that, Mega Blastoise was confirmed to be stronger than a regular one, and Blastoises do not need to go binge-eating Goldeens to use their attacks. The most important result, however, was that turtles, even when equipped with super strong water cannons, in fact cannot fly. Bainbridge, J. (2014) “Gotta Catch ‘Em All!” – Pokémon, Cultural Practice and Object Networks. The IAFOR Journal of Asian Studies 1(1): 1–15. Bulbapedia. (2015) Blastoise (Pokémon). Available from: http://bulbapedia.bulbagarden.net/wiki/Blastoise_(Pok%C3%A9mon) (Date of access: 20/May/2015). Munson, B.R. ; Young, D.F. ; Okiishi, T.H. (2004) Fundamentos da Mecânica dos Fluidos. Edgard Blücher, São Paulo. OMEGA Foundation. 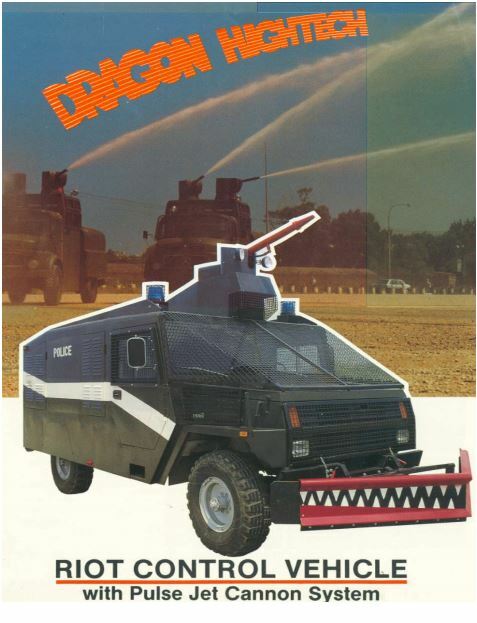 (2000) Crowd Control Technologies (An appraisal of technologies for political control). European Parliament, Directorate General for Research, Luxembourg. Peraire, J. & Widnall, S. (2009) Lecture L14 – Variable Mass Systems: The Rocket Equation. Available from: http://ocw.mit.edu/courses/aeronautics-and-astronautics/16-07-dynamics-fall-2009/lecture-notes/MIT16_07F09_Lec14.pdf (Date of access: 08/Jun/2015). SELFNutritionData. (2015) Fish, bass, freshwater, mixed species, cooked, dry heat. Available from: http://nutritiondata.self.com/facts/finfish-and-shellfish-products/4209/2 (Date of access: 09/Jun/2015).